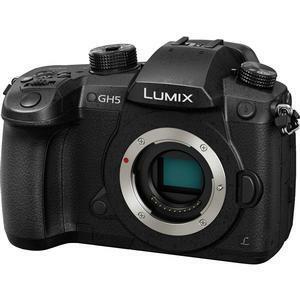 The Panasonic Lumix DC-GH5 delivers a high-end, hybrid performance to photo enthusiasts and professional videographers. Features start with a 20.3MP Micro Four Thirds MOS sensor with no low pass filter for exceptional images. It records 4K video with internal recording at 4K 60p/50p. 5-Axis Photo/Video Dual I.S. 2 provides up to 5 stops of stabilization with compatible LUMIX MFT lenses, plus in-body stabilization support for classic non-O.I.S lenses. Depth-from-Defocus technology achieves fast and accurate focusing. Additional features: Full size HDMI terminal; dual SD card slots; OLED viewfinder; 3.2-inch vari-angle touchscreen; ISO up to 25,600; weather-sealed body; built-in Wi-Fi and Bluetooth connectivity; 6K PHOTO burst mode; ultra-durable shutter unit; plus much more!